I read this book at the (strong and insistent) recommendation of Sherry at Semicolon. She all but threw the book at us on this one and before I felt further injured by my not having read this story, I scooted to the library post haste and reserved a copy to read. I do not regret it. Truthfully, this is not my type of story. At all. It deals with issues - deep ones. And although I may have fooled some of you into thinking that I like to deal with deep issues, the truth of the matter is that I frequently do not (at least in fiction - non-fiction is a different matter, I do suppose). I would rather run back to Anne and pin Queen Anne's Lace in my hair while staring out at a moonlit ocean than suffer through the Louisiana swamp lands. However, Sherry said everyone should read it and because I respect her opinion on books, I obliged. Like I said, I'm glad I did. I really do not want to give any spoilers away in this post because I truly believe that you will find this book captivating as it slowly unfolds. In short, this book tells the story of the Rev. Hale Poser as he struggles to make his way and find out who he is in small town Pilotsville, Louisiana. I very much appreciated Dickson's development of Poser's character. He builds him up very creatively and allows you to journey with Poser in powerful ways. Hale Poser is one of the most interesting characters I have read about in some time, specifically because he causes you to think introspectively about your own spiritual walk. Without warning and almost without even realizing what Dickson is forcing you to do - you will have to consider your own attitudes, behaviors and spiritual walk. As you regular readers know - I do not appreciate much of today's modern Christian fiction and consider it pretty much a waste of time. That being said, a few authors are starting to pop out at me, convincing me that I've written this genre off too quickly. Athol Dickson gives me pause. I think I must join Semicolon in (strongly) recommending this book. I can't promise you'll like it in the way you probably enjoy most of your fiction reads. You may not even be moved. I can't say that I was moved; I was intrigued. However, you'll have thought a little bit and that makes the book worthwhile. So glad you liked it, too. 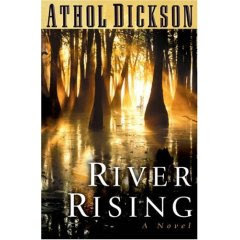 His other two books after River Rising didn't strike me the way RR did, but they were good, too. I like your new template!